Jane, a resident at Sylvan Retreat Apartments in Mountville, Pa., was eager to attend the first class of Nutrition Links, a program hosted by Penn State Extension Lancaster County. While she was looking forward to the taco salad recipe and meal that would be shared during the class, she was most excited about connecting with the class’s instructor, Donna Sullivan. Jane received her certificate in nutrition from a local extension office and later went on to work as a chef at an assisted living facility for the 34 years. She attended the day’s class with photos from her graduation ceremony and was looking forward to talking with Sullivan about the nutrition program and instructors. The two shared friendly banter as the class started and as Sullivan began to prepare the taco salad recipe, Jane was by her side cutting tomatoes and shredding lettuce. As the two women worked together to prepare the class’s meal, it was easy to see why and how food brings people of all ages and cultures together. 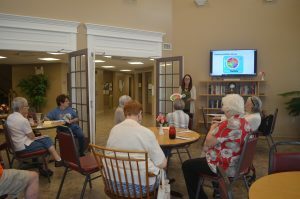 Sullivan has been leading the six-week Nutrition Links program throughout the summer at three HDC MidAtlantic properties in Lancaster County including Sylvan Retreat, St. Peter Apartments and Trinity House Apartments. The series, sponsored and hosted by Penn State Extension provides research-based nutrition education to help people and families with limited resources enhance their nutrition, increase their physical activity and develop life skills needed for self-sufficiency and better health. Classes include hands-on activities and food demonstrations to educate residents on food selection, dietary intake, management of resources, portion control, nutritional values and food safety. The program is funded by the U.S. Department of Agriculture and does not supply free food or Supplemental Nutrition Assistance benefits but rather provides participants with the knowledge and skills to plan and prepare a healthful diet on a limited budget. Research shows lower-income households purchase more affordable but less healthy groceries like cereals, pasta, potatoes, and fatty meats. Produce is often overlooked or not easily accessible, and is commonly limited to iceberg lettuce, potatoes, canned corn, bananas, and frozen orange juice. In Nutrition Links, residents are taught the nutritional value and other information about common grocery staples so consumers can make healthier decisions that fit within their budgets. For example, residents are encouraged to buy beans, which are low-cost but also a good source of protein and fiber. The program further provides residents with helpful tools like sample shopping lists, quick reference guides for nutritional values and healthy recipes. Collaboration with partners like Penn State Extension is one of the ways HDC MidAtlantic fulfills its promise to residents to build hope and opportunity by providing a safe and affordable place to call home. Our Resident Services are designed to strengthen the mental, physical, financial and emotional health of our residents and communities by connecting residents to resources. Our team does this by focusing on five key areas designed to meet the needs of residents including health and wellness. HDC MidAtlantic believes a strong Resident Services program contributes to long-term stability for our residents. Our efforts are designed to increase self-sufficiency, improve living conditions, create healthy communities, and support youth and caretakers.